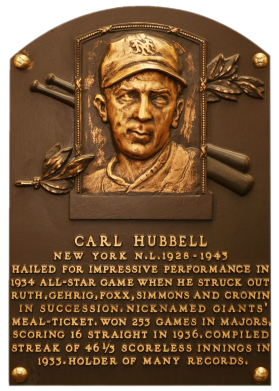 Carl Hubbell used the screwball to notch 253 career wins and a 2.97 ERA, all for the Giants. From 1933 to 1937, he posted five straight 20-win seasons, and was NL MVP in '33 and '36. 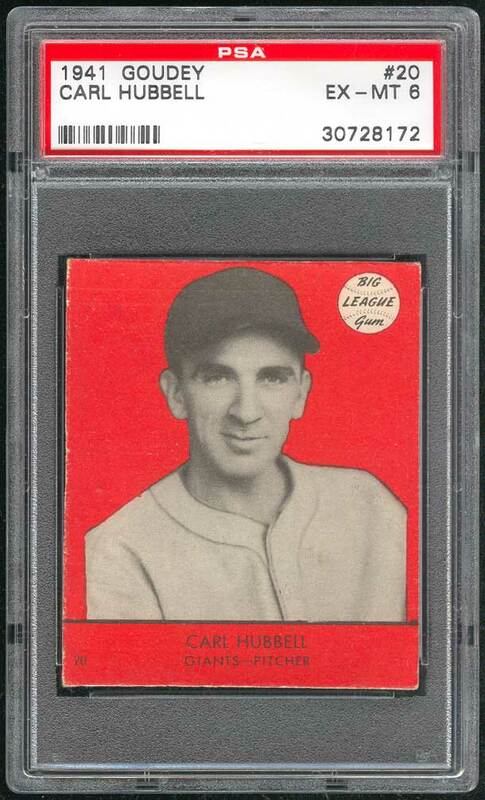 "King Carl" led the NL in wins three times, ERA three times, and in strikeouts once. In the 1934 All-Star game, the lefthanded "Meal Ticket" struck out five straight Hall-of-Famers: Babe Ruth, Lou Gehrig, Jimmie Foxx, Al Simmons and Joe Cronin. 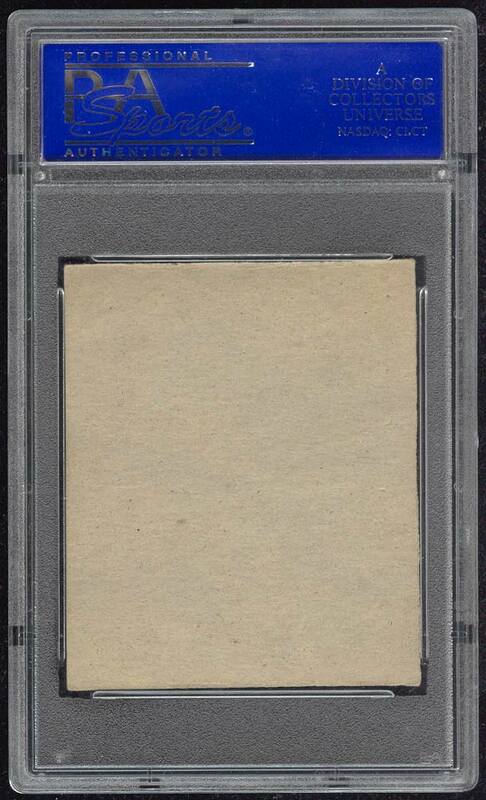 Comments: I won a 1939 Playball PSA 4 on eBay in November, 2002 and upgraded to a PSA 6 one month later with another eBay win. In October, 2003 I upgraded to a PSA 8 when I won an eBay auction from seller sparky62/Bill Kennedy. 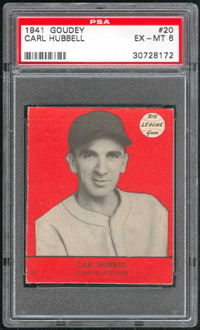 With Charles Klein holding down the 1939 Playball set, I opted to swap out the Hubbell for a 1941 Goudey PSA 4 with an eBay win in May, 2005. 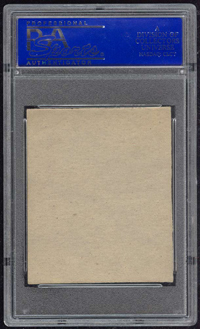 I had just discovered the 1941 Goudey set around that time and really liked the issue. A few months later, I upgraded to this gorgeous PSA 6 with a direct purchase from Mike Skerbe in December, 2005. I have not seen a nicer example (any color) since. 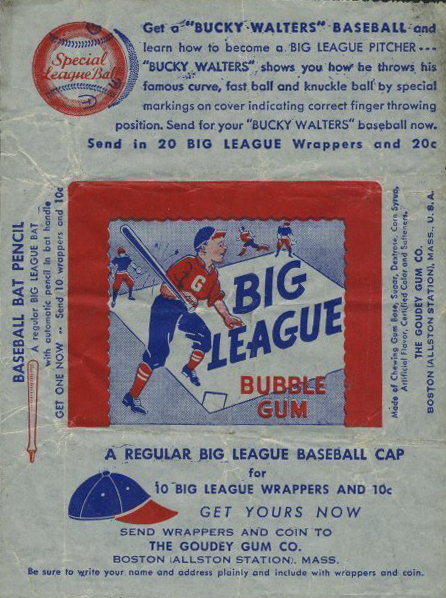 Description: Goudey Gum Co.'s last set was produced in 1941. The 2-3/8" X 2-7/8"cards feature black and white photos set against blue, green, red or yellow backgrounds.